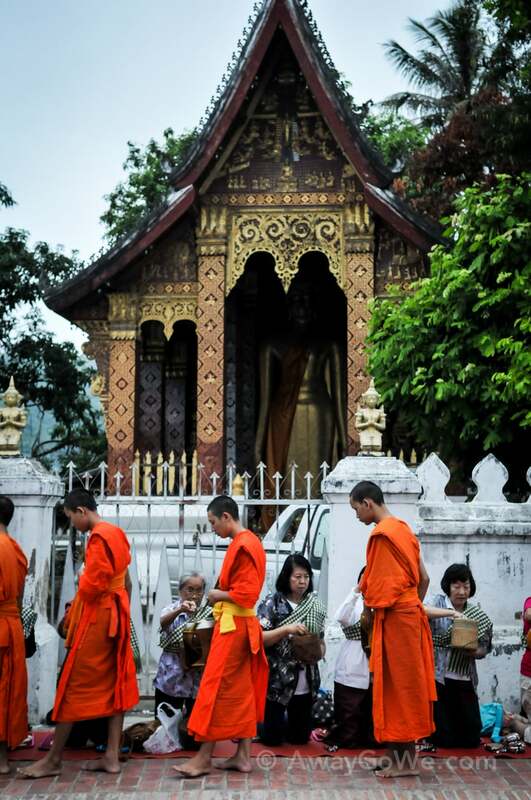 A critical look at this critically endangered religious practice in the heart of the UNESCO Heritage Site of Luang Prabang. 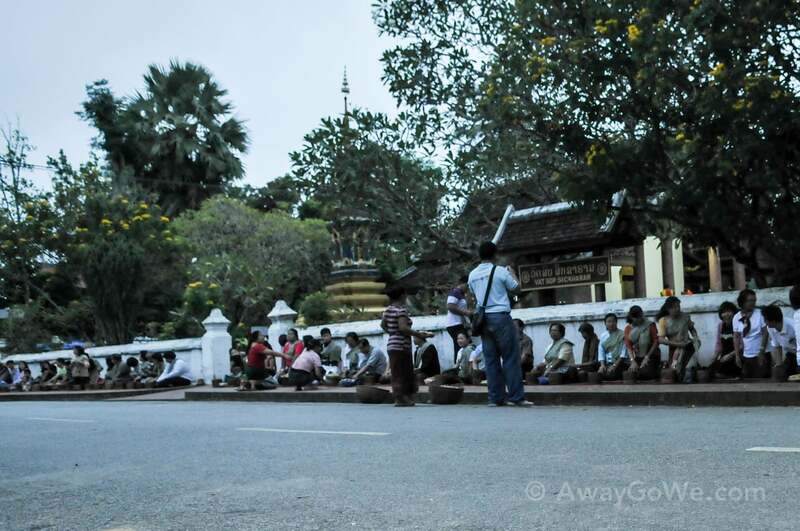 AwayGoWe Posts » Asia » Laos » Can Luang Prabang’s Sacred Tak Bat Survive? 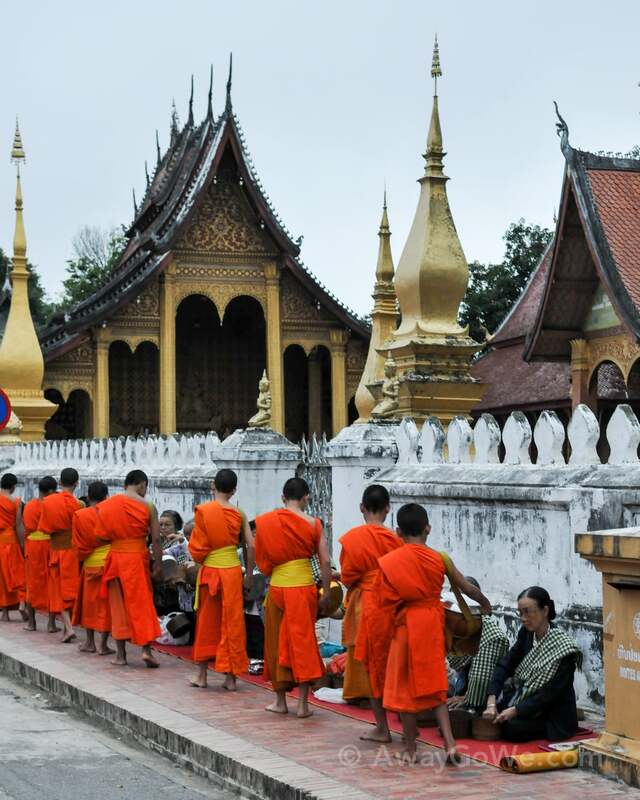 Tak Bat, or monks’ call to alms, occurs just before sunrise across Laos, but the practice in Luang Prabang, in particular, helped put it on the map. 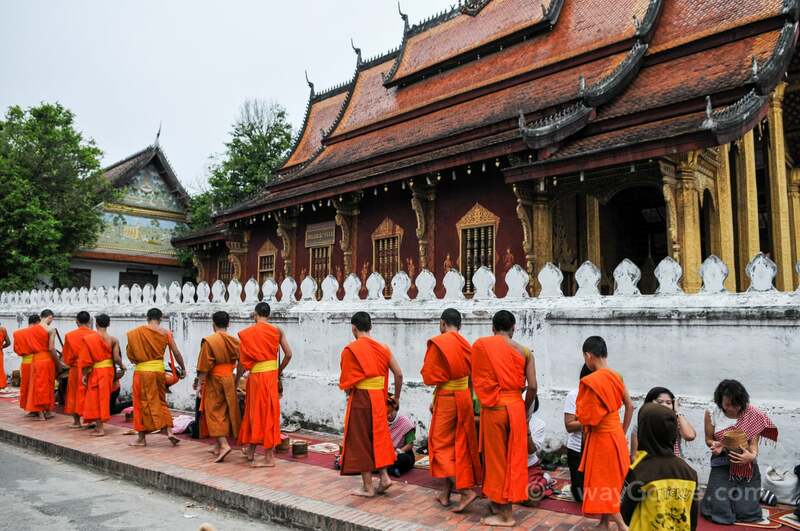 Many fear that the popularity of this ritual of humility and meditation in this UNESCO heritage city may ultimately lead to the end of Tak Bat in Luang Prabang, but many locals are fighting to keep tourists in line and monks healthy and respected. 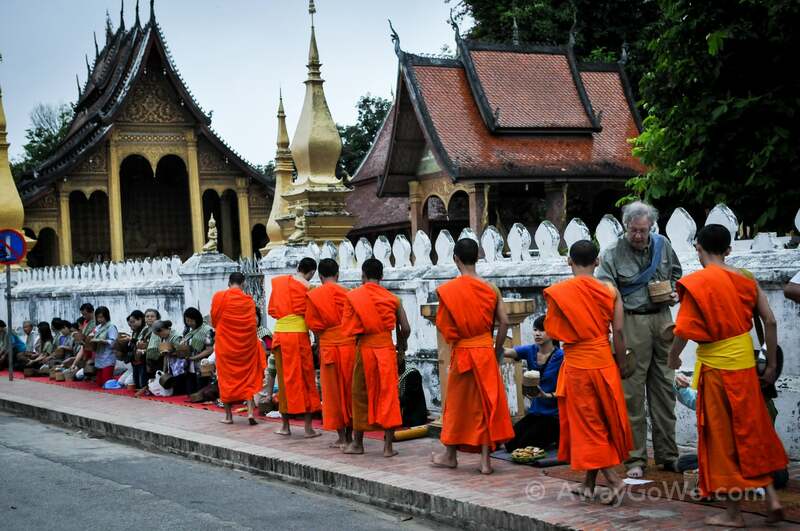 Before dawn, devout local Buddhists line kneel along Th. 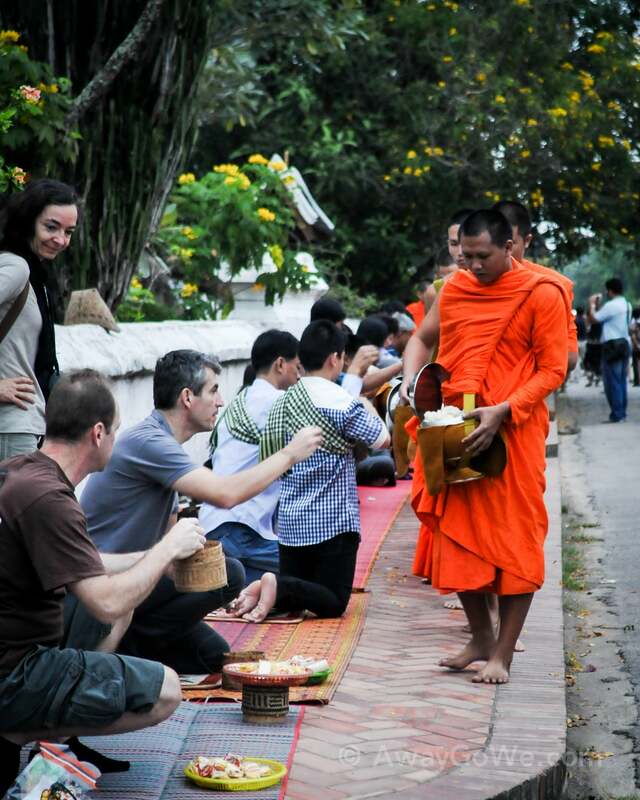 Sakkarin with carefully-prepared sticky rice, waiting for the novice monks to arrive. The mood is solemn and meditative as the participants sit in silence. Then, a faint orange glow appears in the distance, as one-by-one the monks approach. 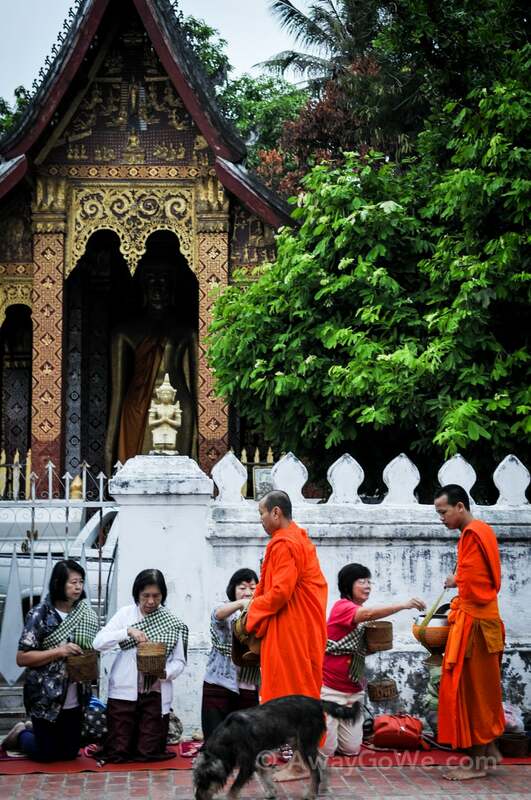 The participants are here to practice their faith and gain merit for the afterlife. 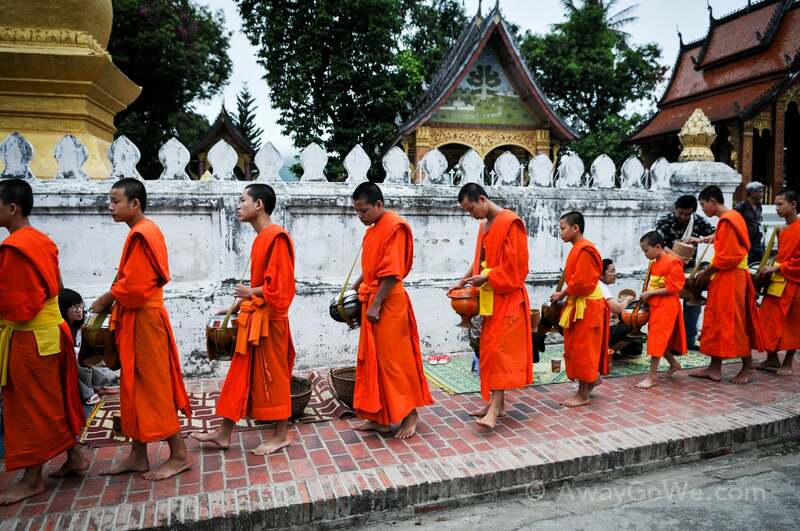 They wear sashes over their left shoulders, ensure that their head is lower than the monks’ and bow as each monk passes, careful to avoid eye contact — all signs of the utmost respect for the barefoot, saffron-clad individuals in their daily demonstration of faith and humility. In recent years, tourist participant numbers have dramatically increased. 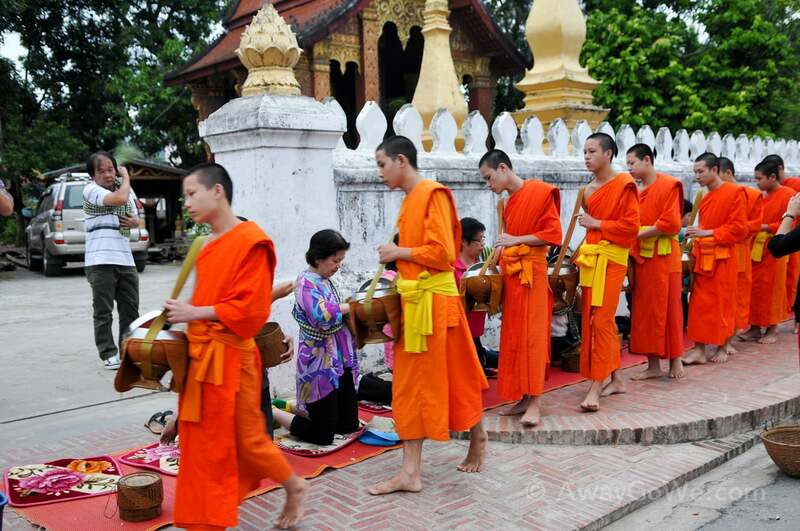 Some are practicing Buddhists, here to demonstrate their faith and respect. But an increasing number see it as a mere cultural show to participate in or tick off a bucket list. Little by little, this latter group has been growing and there are fears that they will soon outnumber practicing Buddhists. Often, these individuals fail to properly educate themselves on the rules and customs, which can manifest in anything from a simple faux pax to major transgression. 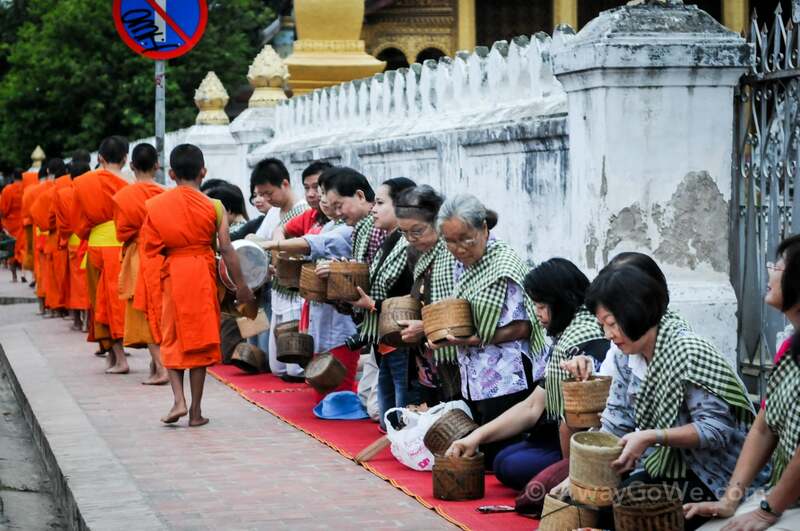 Furthermore, enterprising locals have begun to capitalize on the growing number of tourist participants, selling them leftover or low-grade rice, and several monks have become sick from such rice. 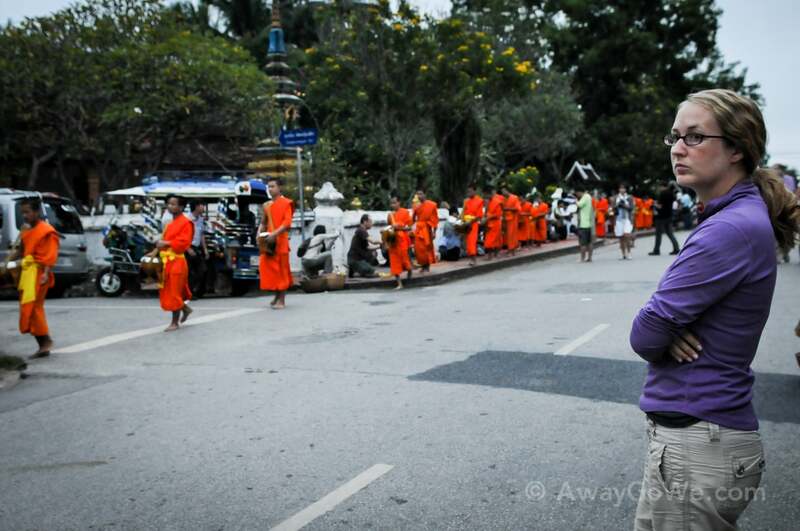 The monks lining the street are novice monks, generally young men and boys who have not yet committed fully to being a Buddhist monk. 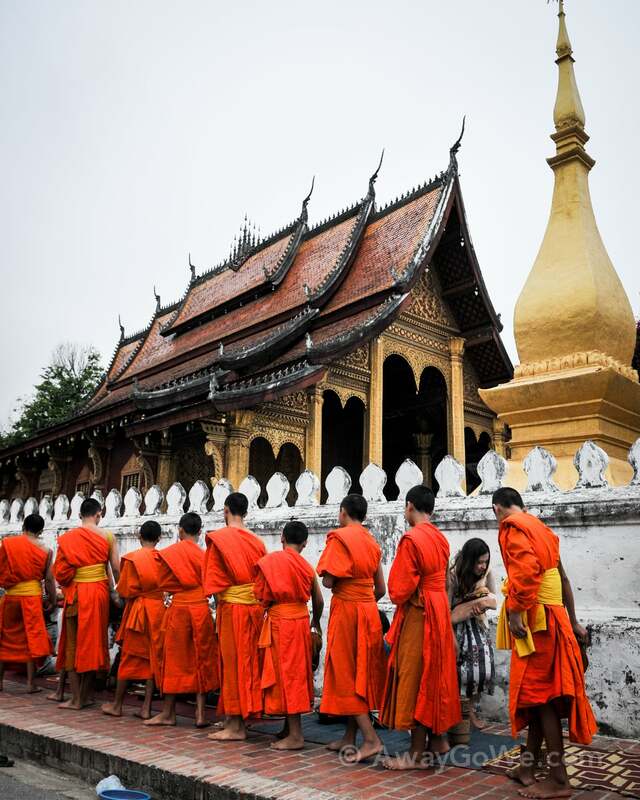 The majority of males in Laos spend some time as novice monks in their life. 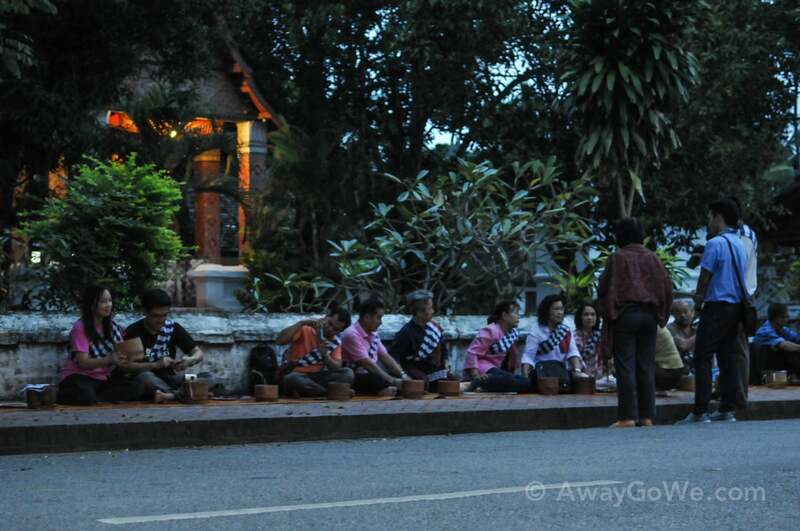 The kao kai noi sticky rice offered by the devout will constitute the bulk of these young mens’ sustenance for this particular day. 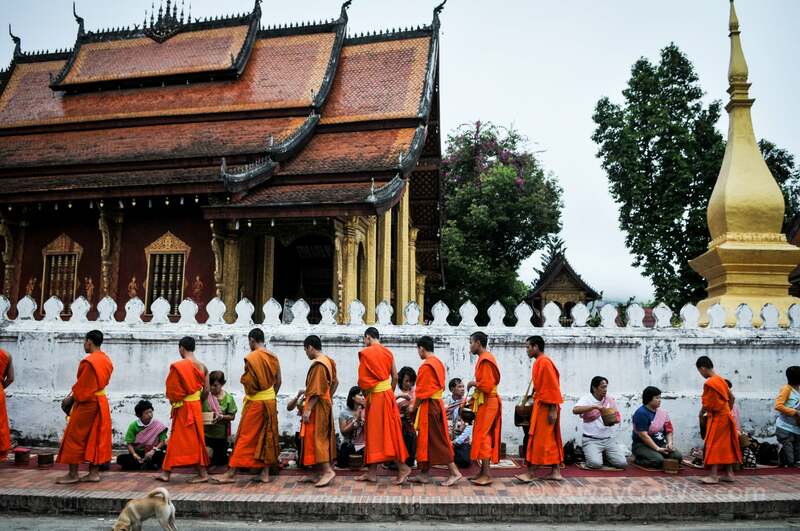 As the sun rises, the endless procession of monks continues. 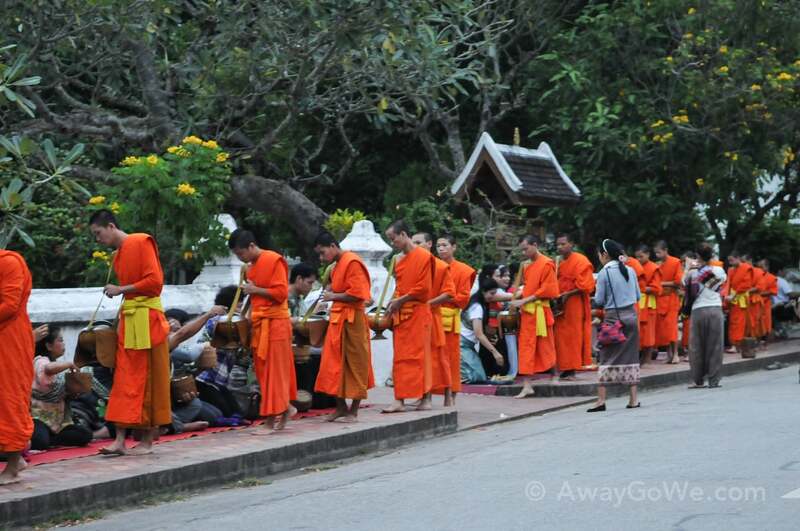 There are just short of a dozen wats in Old Luang Prabang, and hundreds of novice monks taking part in Tak Bat as a result. 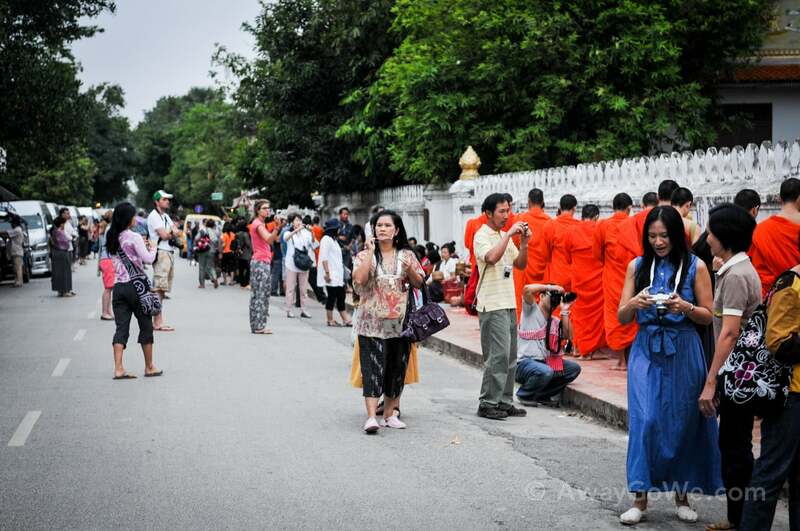 Another problem in recent years has been the brazen and disrespectful attitude of many tourists in taking photos of the procession and monks themselves. 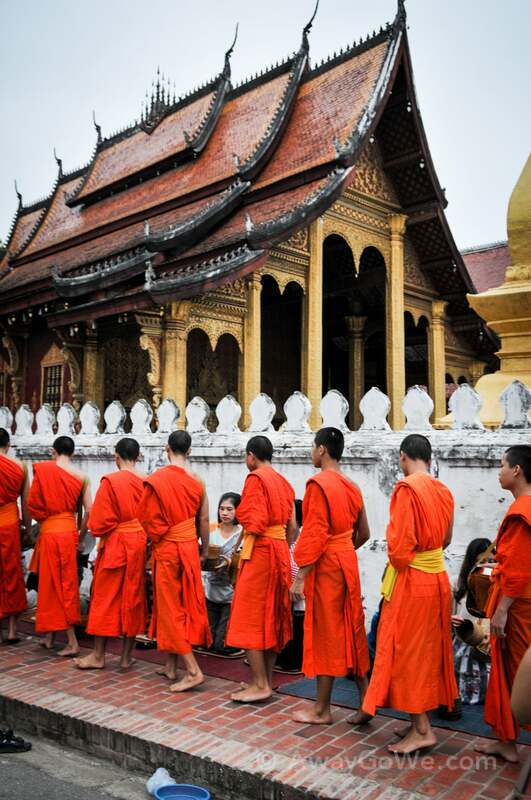 Early in the morning, it was still possible to view the ritual without the hordes of tourists, but by sun-up, lines of minivans and tuk tuks had ferried in dozens of tourists, eager to get an up-close-and-personal snapshot of the monks. You can’t help but be taken by the beautiful, exotic and hugely photogenic scene playing out before you. 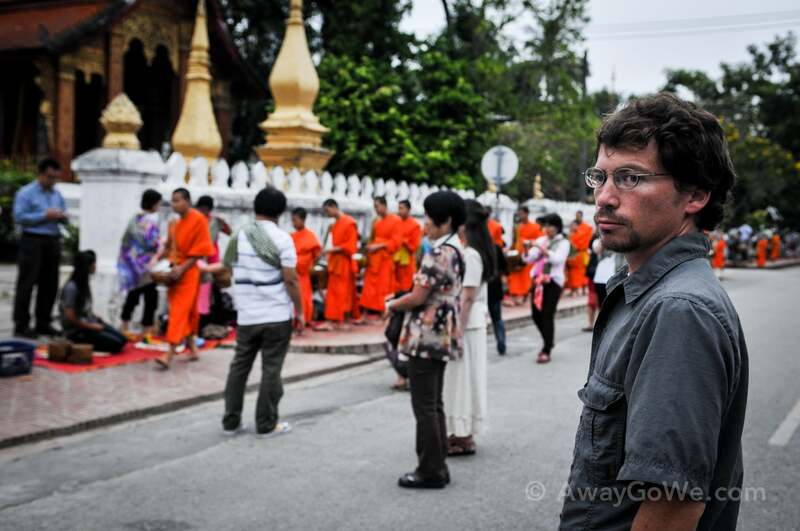 But we were appalled by what many observers did to get their shot, disrupting and disrespecting the monks and the religious tradition in the process. We tried our best to adhere to the rules and tips posted around town regarding being respectful of what is taking place before you. 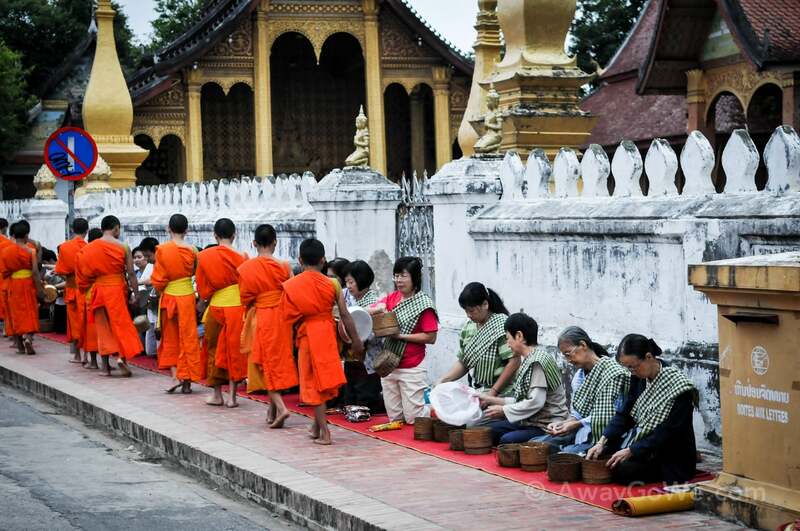 If most observers approached it as the religious devotional exercise that it is, perhaps more tourists would act differently. Instead, sadly, it seems that so many approach Tak Bat as a cultural show put on for them, which it is not. Some of the guidelines we did our best to adhere to was wearing appropriate dress, standing a good distance from the procession, and taking photos from a distance without a flash and with a long (zoom) lens — generally, the more discreet, unobtrusive, and most importantly, respectful you can be, the better. We found it most satisfying to stow the camera completely after ten minutes, and simply observe the procession from across the street, despite the many onlookers who opted differently. In short, you can’t seem to go wrong with observing quietly and respectfully from a good distance. 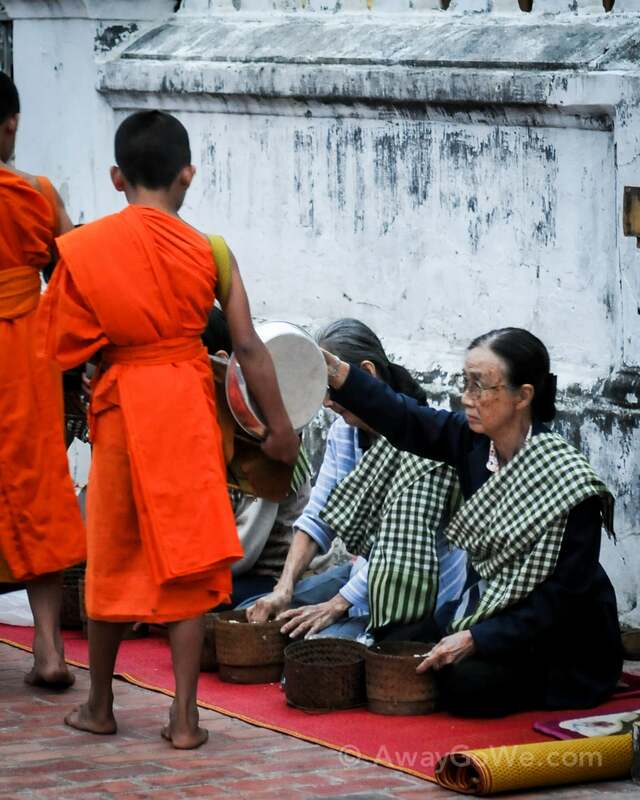 We feel incredibly grateful for the opportunity to have been able to witness this beautiful and meaningful demonstration of humility and faith, and are indebted to these novice monks and their community for allowing us to be present. 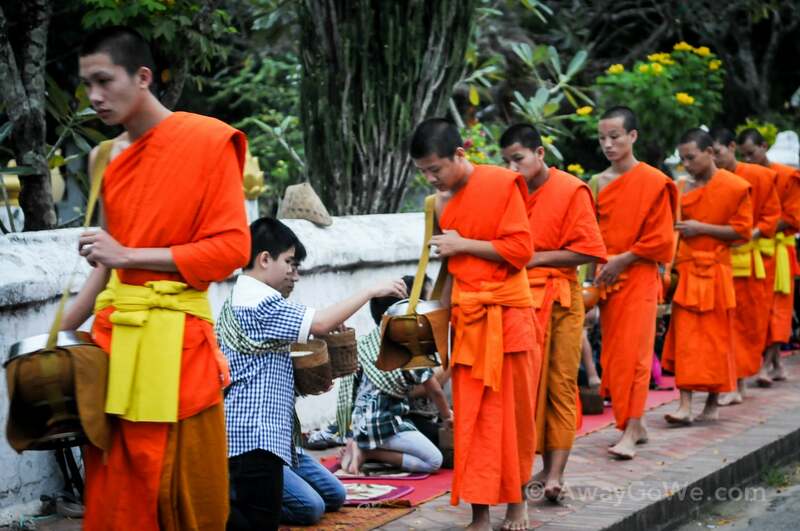 My sincere hope is that others will approach Tak Bat in Luang Prabang in a similar vein, so that generations to come can continue witness and respectfully take part in this age-old tradition.